Pack of 100 Certificates - Nevada Power Company - Price includes shipping costs to U.S.
Home > Certificate Quantities for Educators / Business Promotions > Pack of 100 Certificates - Nevada Power Company - Price includes shipping costs to U.S. 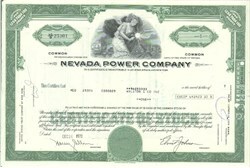 Beautifully engraved certificate from the Nevada Power Company. This historic Stock certificate has an ornate border with a beautiful vignette of an allegorical woman holding a light over a city with the power generating plant behind her. Nevada Power Company is a public utility that generates electricity and transmits and distributes it to almost 1.5 million residents in southern Nevada, including Las Vegas. The company also provides 40 Percent of the electric power for the Nevada Test Site. Nevada Power produces electricity primarily at coal-fueled plants that it co-owns with other utilities, but it also uses oil- and natural gas-fueled plants and purchased power. In response to the planned deregulation of public utilities in Nevada, the company has agreed to merge with the Sierra Pacific Power Company in a deal that would make it a part of Sierra Pacific Resources.